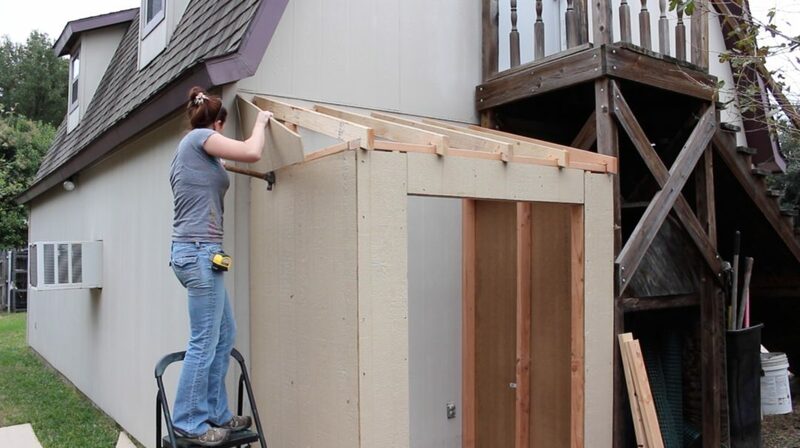 This week, I am going to continue with building my Lean To Shed. 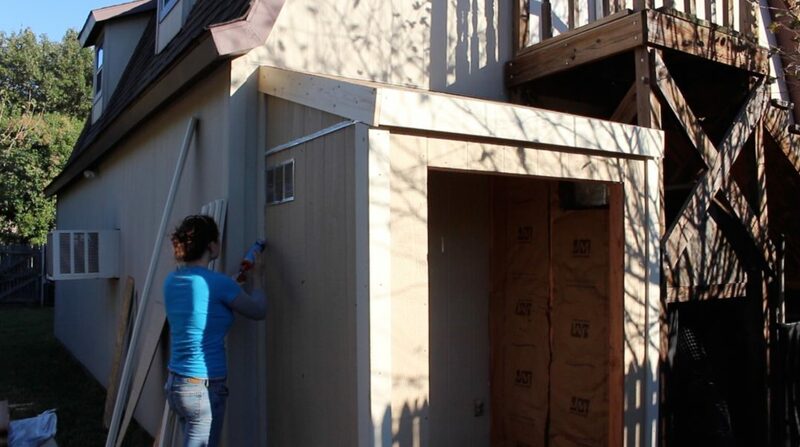 If you missed my previous posts, where I did the framing and siding, you can check that out HERE. 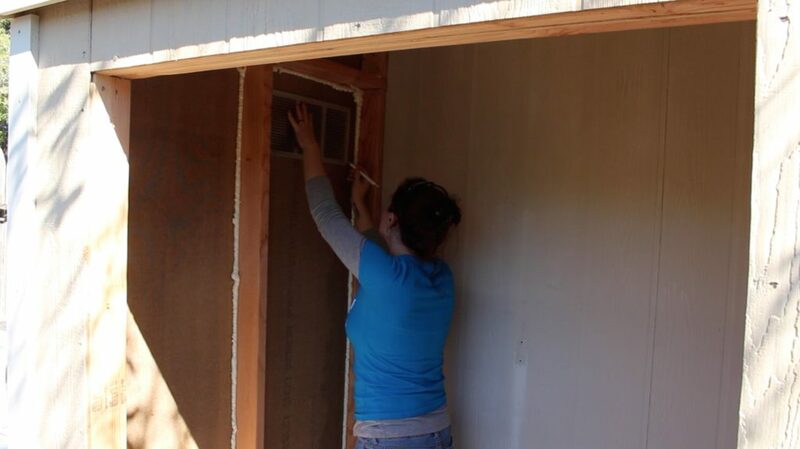 This week, I am going to be getting all of the caulking, trim work and the insulation done. 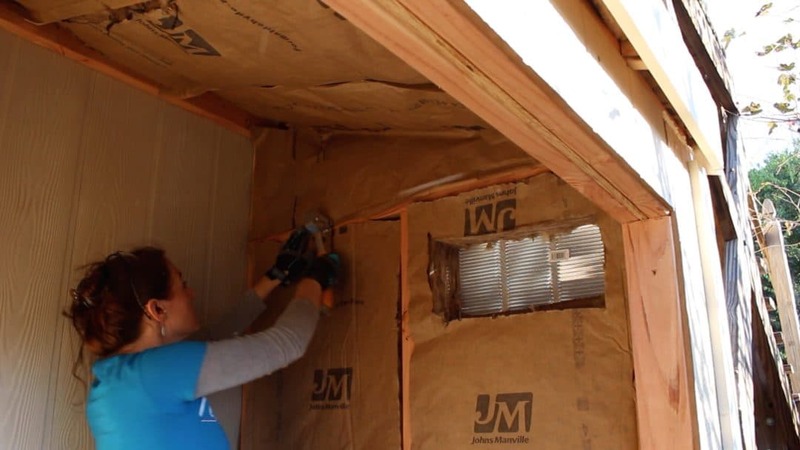 Note: I am insulating my lean to because I plan to put my dust collector and my air compressor inside and want to reduce the noise as much as possible, to be courteous to my neighbors. The first thing that I did was remove the triangle pieces from the siding that I installed last week. A few of the commenters from my video recommended that I use something called Z-Flashing. What this flashing does is keeps the rain from going in the crack that is created by joining two pieces together. Also, while I was here I went ahead and added another stud along the back; another suggestion from experienced framers who watched my previous video. : ) I then added my Z-Flashing. I bought a 10′ joint of Z-Flashing and used a pair of tin snips to cut it to length. Before laying it down, I purchased some caulking and I made sure to purchase the type that said paintable and weather-proof. I laid down a line of caulk and then put my Z-Flashing in place. I put more caulking all along the top of the flashing as well as the seam from the new cripple stud and the existing building then reattached my triangle siding piece. I reattached my triangle siding piece with my framing nailer, then repeated the same steps to the other side. 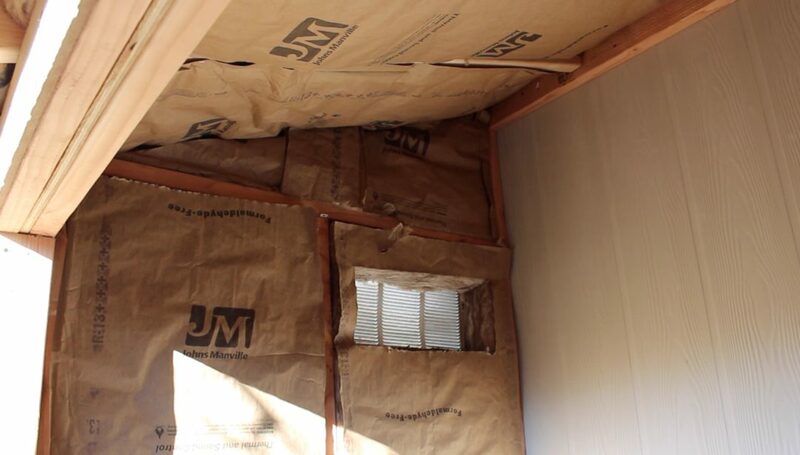 The next thing I did was grab some 1/2″ OSB and cut it into pieces, with my circular saw, in order to make the roof. Since I was trying to get all of the roof from one sheet of wood I ended up with three pieces. Once my boards were all cut to size, and positioned into place, I nailed it down to the rafters. Note: If you have more than one piece make sure to cut them so that they will share a rafter. For example: I made my boards meet on the center rafter. Also make sure to leave about an 1/8″ gap between the boards when you piece OSB together. I used some nails as a spacer. I went ahead and primed and painted all of the boards before putting them up, just to make painting later, easier. However, you don’t have to paint it beforehand. Before adding the front fascia I used some siding scraps to make some patch pieces for the sides of the two end rafters. You need to be sure to do this so that the surface of these rafters are on the same plane as the sides. 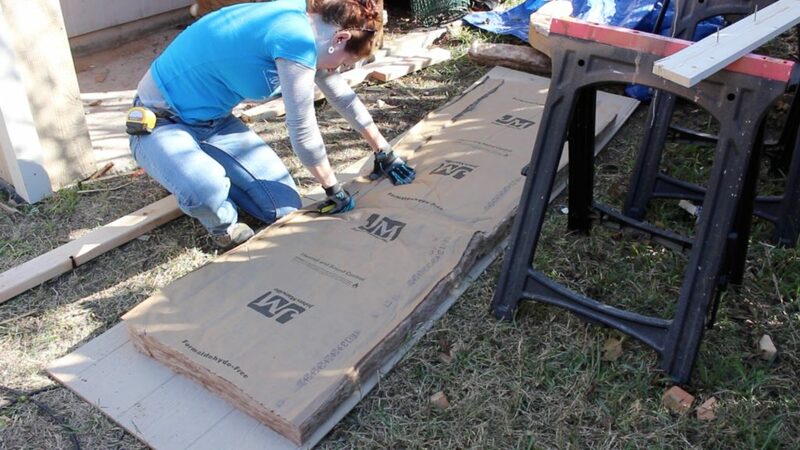 This way when you add the rake fascia, it will have an even surface to sit flush on. These pieces don’t have to be an exact fit or very pretty looking because they will be covered up. I used pilot holes and screws to attach these because I didn’t want to split the rafter tails by using the nail gun. I attached the front 1″X6″ as the fascia. I went ahead and used a pilot hole and screws here as well. Note: use a straight board or a speed square to get the placement of this board exact. You want it to be in line with the roof, not flush. So set the square (or board) flush with the roof and move the board until it’s in line then attach it. After the front board is cut and attached, then I used another 1″X6″ to make up the side boards which is called the rake fascia. To figure out the angle I would hold the board in place then trace a line on the backside with a pencil. 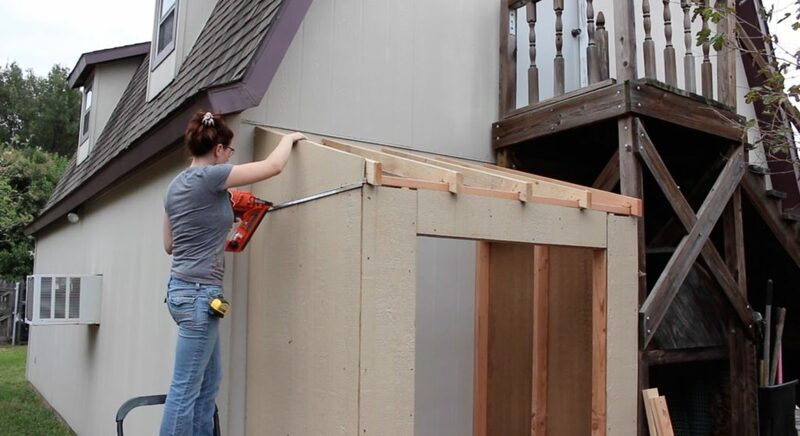 Then I would cut it using the miter saw and attach them into place using my nailer. My board wouldn’t sit flush on the front because the Z flashing was in the way, so I took a hammer and knocked it down a bit on the front and that fixed the problem. Next I moved down to the body of the lean to where I used 1″X4″s. I started with the side trim pieces first, then came back to attach the front trim boards. Once those were done on both of the sides, I moved to the back and attached another piece. To get the angles of these boards right, just hold them in place and trace the line with a pencil. I went ahead and left the soffit out for the time being because I wanted to have access to this little spot when I did the insulation. I probably should have done this step sooner, but oh well. I needed to add some vents so that there will be a method of air flow. I picked up two cheap wall vents and first traced around the perimeter then came back with a tape measure and measured in 1/2″ in a few different spots. I then connected the dots with a straight edge and this created the hole I actually needed to cut out. When you are placing these vents, it’s best to have them on opposite walls and if you can, one forward and one back, to create cross ventilation. To cut the holes I first drilled four holes in the corners then used my Triton reciprocating saw. Then I moved to the outside to attach the vent with screws. Be sure the slats are facing down. I am using pre-cut kraft faced batts by Johns Manville once again. These are thermal and sound control insulation panels. I would cut my batts to size using a box blade and then I would position them into place. 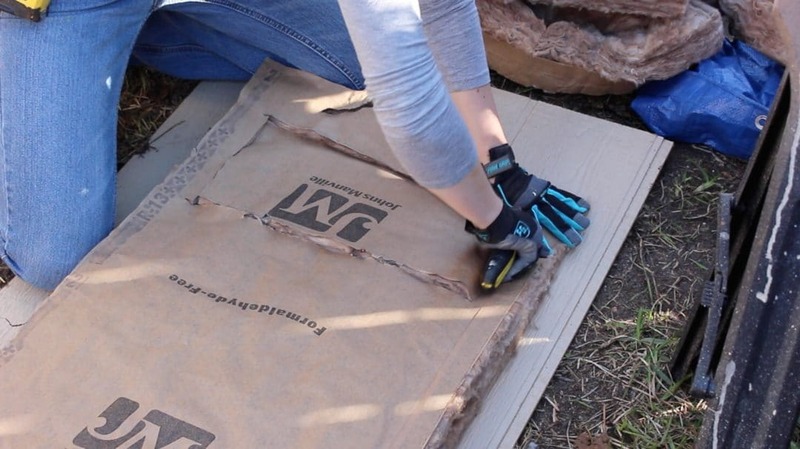 If you’ve never done insulation before, you want the batts to be a nice friction fit. You don’t want to smash them into place but you also don’t want to have any gaps. Also be sure to wear safety glasses, gloves, long sleeves and long pants because fiberglass is very itchy. For the cavities with the wall vents, I would cut the batt to size then use a pencil to mark out the location of the vent. I used the box blade to cut the hole, then placed the batt into the cavity. 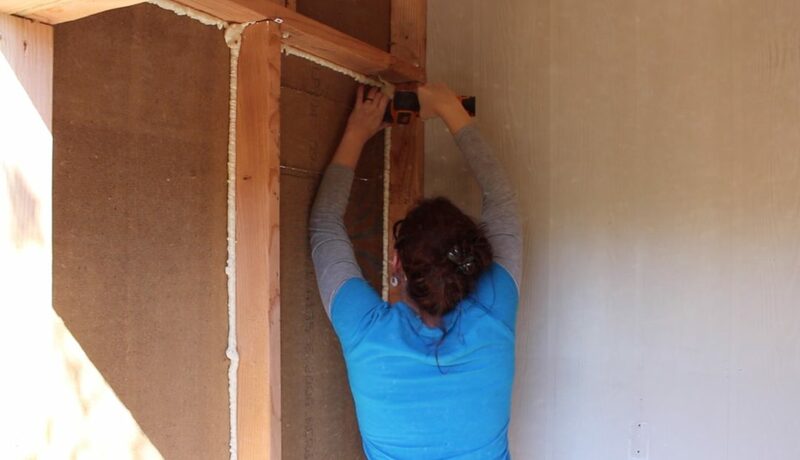 I went through and insulated all of the wall panels first. This went very quickly since it is a small, little space. 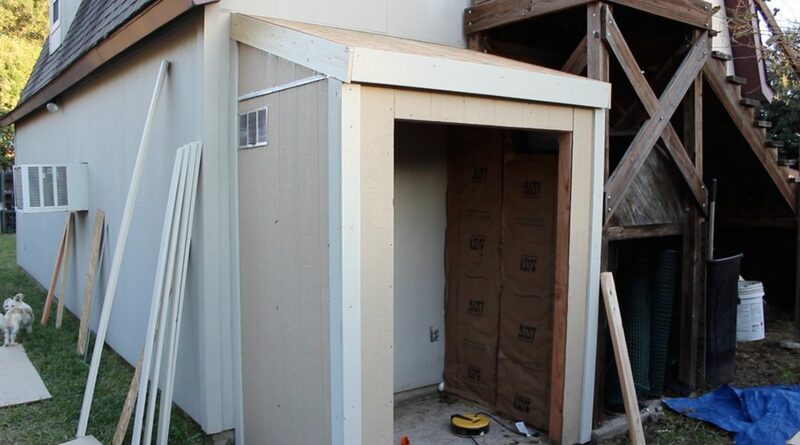 Next, I insulated the roof, in-between the rafters as well as the triangle pieces and above the door. I stapled the flanges of the insulation using my staple gun. Now I went through and caulked all of my seams. I am trying to make this as water-proof as possible as I don’t want any water getting into my shed. So any seam that I could see, I went through and added a line of caulk. I would drag the gun to make a good size bead the entire length and then come back with a damp cloth and drag it down the entire length, to smooth it out. Annnd, that’s as far as I was able to get this week. So next I will be doing the roof and the double doors! I’m really looking forward to that so stay tuned. If you liked this project and want to stay up to date with what I’m building, then be sure to sign up for my email newsletter and you’ll get an email when I post something new. See you soon!